A step-by-step approach to treating and preventing sinusitis starts with a simple nasal wash. If you've ever had a cold that just wouldn't go away, chances are it was sinusitis — an inflammation of the paranasal sinuses, the cavities within the bones that surround the nose. The sinuses are lined with a thin membrane that produces mucus, which is normally swept along by hair cells and drains through small openings into the nasal cavity. Sinusitis (also called rhinosinusitis) starts when this drainage system becomes blocked, usually from swelling due to inflammation caused by infection or allergy. Soon, your head hurts, you feel facial pressure or pain, and thick mucus clogs your nose. The symptoms may clear on their own, but often they persist or repeatedly return. Several years ago, Dr. Ralph Metson, a sinus specialist at Massachusetts Eye and Ear Infirmary in Boston, conducted a study of the effects of chronic sinusitis on daily functioning. Dr. Metson says he and his colleagues undertook the research because so many of his patients felt that no one understood how miserable sinusitis could be. Comparing the impact of chronic sinusitis with that of other chronic illnesses — including heart failure, back pain, and chronic obstructive pulmonary disease — the Harvard researchers found that sinusitis sufferers reported the highest levels of pain and the lowest levels of social functioning, as well as significant problems with work, energy, and mental health. The paranasal sinuses comprise four pairs of sinuses that surround the nose and drain into the nasal cavity by way of narrow channels called ostia (singular: ostium). 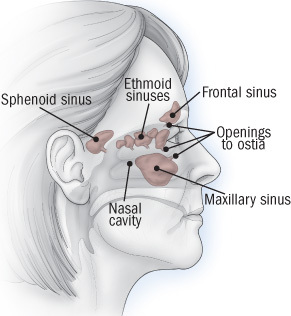 Mucus leaving the frontal (forehead) and maxillary (cheek) sinuses drains through the ethmoid sinuses (behind the bridge of the nose), so a backup in the ethmoids is likely to clog the other two types of sinuses. The sphenoid sinuses are located deep in the skull, behind the eyes. 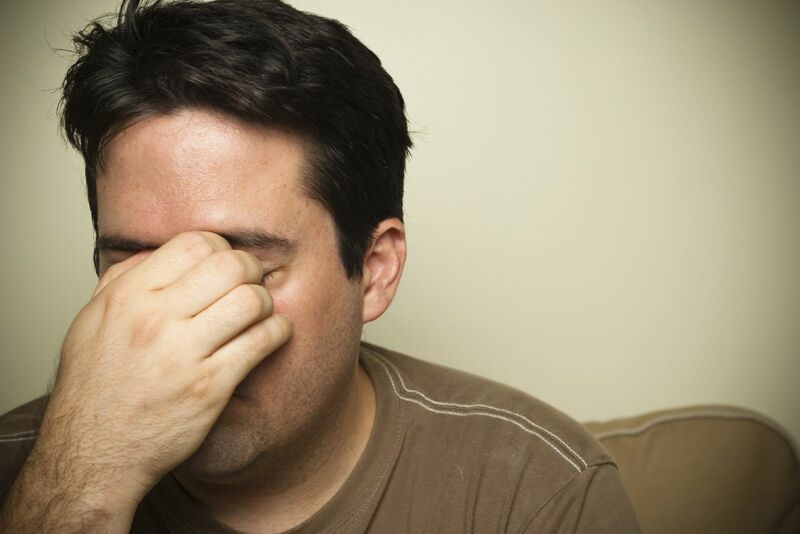 Sinusitis develops when one or more sinuses become blocked. There are millions of bacteria in our noses, and most of the time, they're harmless. Even when a few creep into the sinuses, they don't cause trouble, as long as they keep draining into the nose along with mucus. But if sinus drainage is blocked, glands in the sinuses continue to produce mucus, and the resulting pool of backed-up mucus provides what Dr. Metson calls "the perfect culture medium." The bacteria grow out of control, causing infection, and the immune system kicks off an inflammatory response. The result: swelling, which causes headache and facial pain; mucus buildup, which produces congestion; and an influx of white blood cells to fight the bacteria, which thickens the mucus and may tint it yellow or green. Other symptoms include loss of smell or taste, cough, bad breath, fever, toothache, and fullness in the ears. Sinus blockage can have a variety of environmental, anatomical, and genetic causes, but the main culprit is swelling of the nasal passages produced by the common cold or allergies. More serious sinusitis can result from structural problems, such as a deviated septum (a crook in the partition that separates the right from left nasal cavities) or nasal polyps (small, grapelike growths in the lining of the sinus cavity). Stir ½ teaspoon of non-iodized salt and ½ teaspoon of baking soda into 2 cups of lukewarm distilled or previously boiled water (as recommended by the American Academy of Otolaryngology). Lean over your bathroom or kitchen sink, insert the tip of the syringe just inside one nostril, and gently squeeze the bulb. The water will run back out the nostril (or possibly the opposite nostril) and into the sink. Use at least one full bulb of solution. Thoroughly rinse (with distilled or cooled boiled water) and dry the bulb syringe or neti pot after each use. Sinusitis is classified by how long it lasts. "Acute" sinusitis lasts a month or less; "subacute" sinusitis, a month to three months; and "chronic" sinusitis for longer than that (sometimes for years). If several acute attacks occur within a year, it's called "recurrent." Treatment begins with simple remedies, such as nasal irrigation (see the box above) and if necessary progresses to more advanced strategies, such as prescription drug therapy or surgery. Acute sinusitis. Acute sinusitis usually starts with a cold. Viruses, not bacteria, cause colds, so it's useless to treat them with antibiotics. But when a cold turns into sinusitis, it means that blocked nasal passages have set off a secondary infection caused by bacteria and you may eventually need an antibiotic. Rarely, especially in people with weakened immune systems, a fungal infection is the cause. If symptoms are severe and last for more than a week, you may want to see your primary care clinician. Based on your symptoms and a look inside your nose with a small flashlight, she or he can usually tell whether sinusitis has settled in. If you do have sinusitis, you may be prescribed an antibiotic, especially if preventive drainage strategies aren't helping. Antibiotics are usually given for 10 to 14 days, but trials suggest that in some cases, three to seven days are sufficient. The first choice is often amoxicillin or amoxicillin combined with clavulanate (Augmentin). Many clinicians have found that a five-day course of azithromycin (Zithromax) also works well. Chronic sinusitis. If symptoms linger or keep returning, you may have chronic sinusitis, a more complex disorder that calls for evaluation by an ear, nose, and throat (ENT) specialist (also called an otolaryngologist). She or he will order a CT scan of your nose and sinuses and examine the nasal cavity with a thin lighted tube (endoscope) to look for causes of the blockage. Blood and allergy tests and bacterial cultures may also be needed. Nasal irrigation and decongestants can help in the treatment of chronic sinusitis by keeping mucus loose and nasal passages clear. The mucus-thinning agent guaifenesin (Mucinex) is another option. (Be sure to drink a full glass of water when you take it.) Nasal steroids such as fluticasone (Flonase) or beclomethasone (Beconase) may be added to help counter inflammation. (These must be applied properly to avoid nosebleed. Ask your clinician for instructions in the correct technique.) Oral steroids are also effective, especially in reducing large polyps, but they can have serious long-term effects, such as weakened bones and greater susceptibility to infection. Bacterial infection can be complicated in chronic sinusitis and may require different antibiotics and a longer course of therapy. In some cases, intravenous antibiotics may be needed, mainly when oral antibiotics have failed and surgery isn't possible, or when infection has spread beyond the sinuses. Sometimes the main problem is anatomical, such as nasal polyps, a deviated septum, congenitally narrowed paranasal passages, or tissue thickened by years of infection. In this case, minimally invasive surgery may help, reducing the number and severity of sinus infections and sometimes restoring normal sinus function. Surgery isn't a cure-all: polyps, for example, may grow back. Every situation is different, so it's important to discuss the options with an ENT specialist. Bathe your nasal passages daily. Run water gently into the nasal passages to help clear excess mucus and moisten membranes. (See "First line of defense: Nasal irrigation.") Good times to do it are in the morning and at night, when you brush your teeth. "Brush, then flush," is Dr. Metson's motto. During the day, use nasal saline spray to moisten nasal passages. Drink lots of water. Good hydration helps keep the mucus thin and loose. Have a bottle of water at your desk at work, or put a glass near the kitchen sink to remind you to drink water throughout the day. Inhale steam. Linger in a hot shower. Or bring water to a boil, and pour it into a pan; place a towel over your head, and carefully bend over the pan to inhale the steam. To avoid burns, keep your distance at first and move in gradually to a comfortable zone. Avoid dry environments. A humidifier in your home (in particular, by your bed) and where you work can help prevent nasal passages from drying out. Keep humidifiers clean and free of bacteria and mold. Sleep with your head elevated. Mucus pools in your sinuses at night when your head is down, so have your head propped up with pillows or a wedge during sleep. Avoid antihistamines unless prescribed. Antihistamines make mucus thick and hard to drain. But if your sinusitis is triggered by allergies, your clinician may still want you to take an antihistamine along with other medications. Be careful with decongestants. Tablets containing pseudoephedrine act on blood vessels to shrink membranes and keep nasal passages open. Nasal sprays containing phenylephrine or oxymetazoline also work well — and quickly. But using topical nasal decongestants for more than a day or two runs the risk of setting off a spiral of dependency as a result of rebound — increased swelling after the medication wears off. (According to Dr. Metson, a shorter-acting spray, such as 0.25% or 0.5% Neo-Synephrine, is less likely to cause rebound than longer-acting ones like Afrin.) Oral decongestants can cause jitters and increase blood pressure, so if you have high blood pressure, don't use them without consulting a clinician first. Respiratory tract infection - Is it contagious?